UCLA recently celebrated the 10th anniversary of the rich collaboration between the Agua Caliente Cultural Museum (ACCM) in Palm Springs and the UCLA/Getty Program in the Conservation of Archaeological and Ethnographic Materials. The first class was taught in collaboration with ACCM in 2007, and the fifth class ended in 2017. 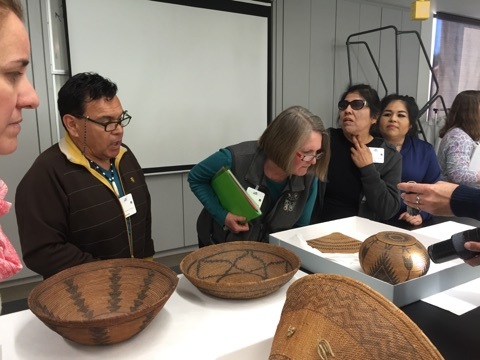 The course, which is required for graduate conservation students in the UCLA/Getty Program, includes collaborations resulting in sharing cultural, technical and analytical expertise among students, ACCM staff, guest basketry weavers, ethnobotanists, curators and community members. Over the past 10 years, a changing ACCM staff, including directors, curators, archivists, tribal board members, and the ACCM Tribal Historic Preservation Officer, have generously shared knowledge with the students about the founding of the museum and its role in the community. Students complete thorough research, examinations, conservation treatments and re-housing of ACCM objects—primarily baskets—based on discussions with ACCM staff and guest instructors. Both technical knowledge and a clear understanding of tribal museum goals are imparted to the students, which taken together with community input invariably impact conservation decision-making. Products of this rich collaboration include a faculty and student co-authored article, as well as both a physical and a virtual exhibit describing conservation methods achieved through collaboration, a virtual exhibit that (temporarily unavailable but described here), and a faculty-student publication describing the impact of that virtual exhibit. 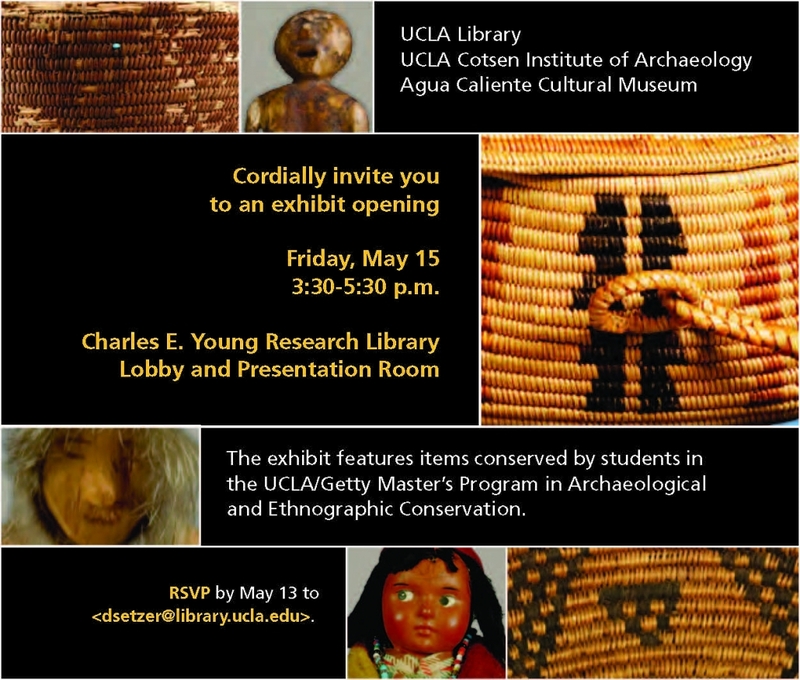 In 2009, UCLA Library hosted an exhibit of ACCM items prepared by UCLA/Getty students. This image is the invitation sent out for the opening event. Between 1983 and 2005, Pearlstein was assistant, associate and senior objects conservator at the Brooklyn Museum in New York. Pearlstein served as an adjunct professor in conservation at the Institute of Fine Arts-Conservation Center at NYU between 1991-2004. In 2005, Pearlstein assumed a faculty position in the UCLA/Getty Program in the Conservation of Archaeological and Ethnographic Material. As a member of the founding faculty, she and her colleagues designed a curriculum, outfitted a laboratory, and Pearlstein began teaching graduate classes in the conservation of organic materials, ethics of working with indigenous communities, preventive conservation and managing collections. In 2008, Pearlstein joined UCLA’s Department of Information Studies, and invited students interested in library, archive, and rare book materials into her preservation and management classes. Her research includes conservation of featherwork, effects of environmental agents; pre- and post-Hispanic qeros from the Andes; developing diversity within conservation, and curriculum development within conservation education. Pearlstein is an elected Fellow in the American Institute for Conservation and, recently, in the International Institute for Conservation, winner of the AIC Keck award, and President of the Association of North American Gradate Programs in Conservation. I wanted to reach out to someone who can inform me a little on Art Conservation and Archaeology. I am currently an Anthropology major whose goal is to be an archaeologist and I recently got a job at the Getty but do not work in my dream department if you will. I would love to have someone to mentor and guide me through any of the programs and to help me narrow down what I am looking for. I would love if anyone would contact me about this.